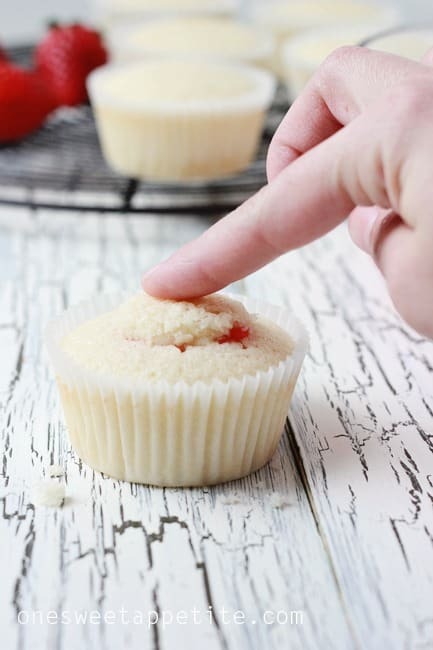 This easy tutorial gives you a quick guide on how to fill a cupcake! Remove the center and add jams, fruit sauces, chocolate, or more! Is there anything better than a fresh baked cupcake? They are easily one of my favorite desserts to make because the flavor combinations are endless and they always look incredibly gorgeous with the pipped icing. While I’m always happy with a plain ol’ vanilla or chocolate the one thing that can take your flavor from basic to gourmet is a good filling. I used to use a paring knife to cut a dome shape out of each tiny treat which was a fairly basic technique. It does not take too long but I was ending up with uneven sizes. Since I needed at least a tablespoon of filling in each one for consistent flavor I decided to test a couple of other techniques. You are going to be surprised at the easy way I swear by, so why don’t we get started? Start with your cupcake, filling, and the surprise helper in this adventure… A piping tip. I like to use a fairly large one to get a decent sized hole. How do you cut the center out of a cupcake? I used an Ateco 825 which has a large base. THAT is what you are going to want. The bigger the better. That will determine the size of our cupcake center giving you lots of room for fillings. 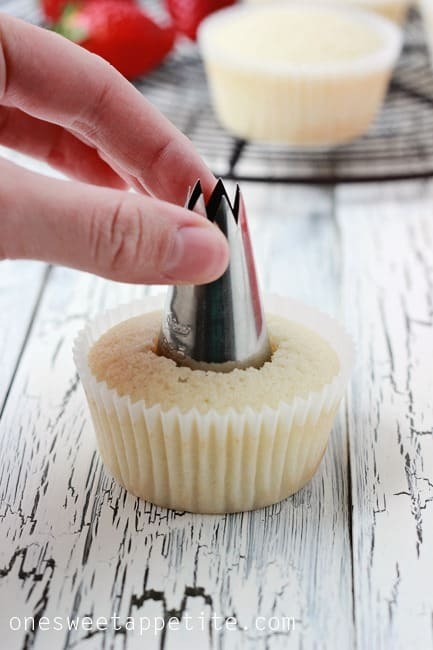 Place the back of the tip onto your cupcake and twist it down until you think you are at the middle. 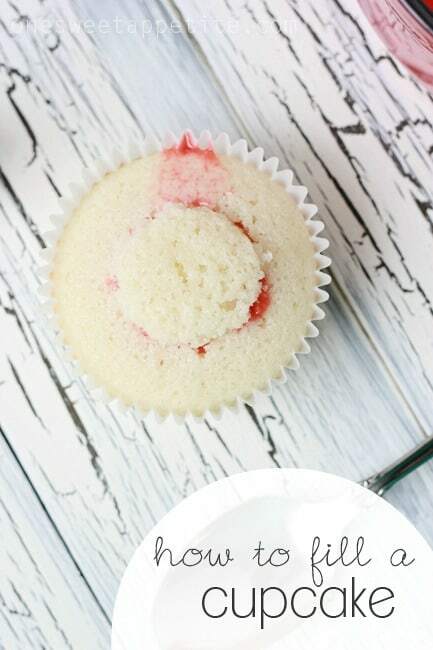 A hole in your cupcake and the top in your piping tip. 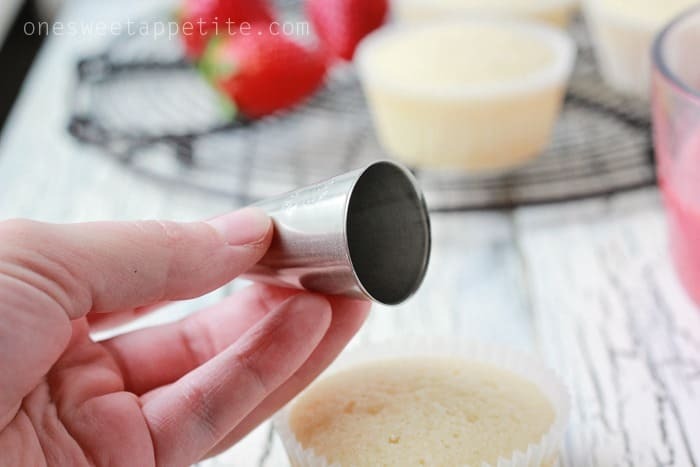 Give it a few small taps on the table and the top of your cupcake should fall out. Do not throw it out! We will need that in just a second. 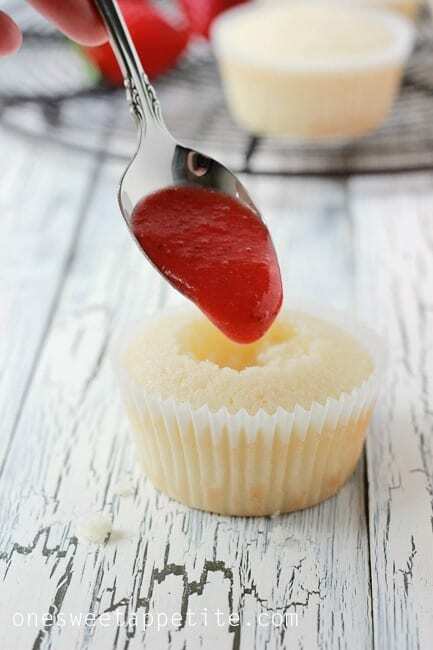 Use a spoon to fill your cupcake with whatever filing you desire. I used strawberry champagne filing for this one. You can either leave the top off or place it back on. I am a fan of the second option. It leaves a cleaner finish for adding your frosting. Like this tutorial? Give it a try with my Strawberry Champagne Cupcakes, Butterbeer Cupcakes, and Mocha Cupcakes! What do you think? Not too hard, right? Using this method I can fill 12 cupcakes in about five minutes. It is so quick and leaves you with a nice clean looking cake. mmm filled cupcakes taste so good, but I too have been afraid to make them! Can’t wait to try now (but actually I dont own any any piping tips! 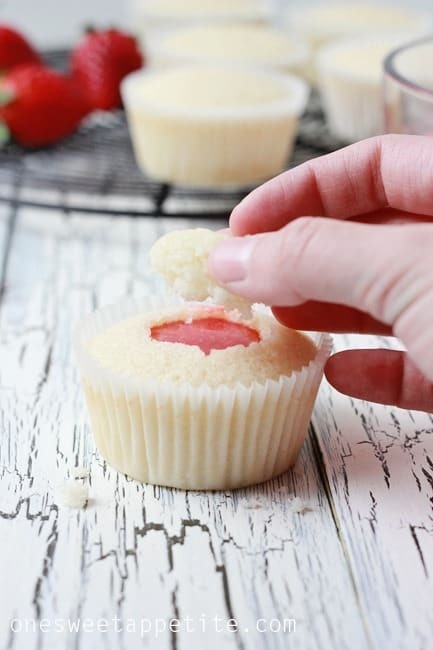 Do you put the entire top back on the cupcake once the filling is added? Seems like there wouldn’t be enough room? And could you share your filling recipe? I like how it looks! Some recipes I have seen are either jams, preserve s or chunky and I’m looking for smooth like what is in your pictures 🙂 I am having a surprise parry next weekend and would love to do this. Yes. Just press the cupcake top right back on. Occasionally I’ve had some kind of squeeze out the top but once they are covered with frosting you can’t even notice. Alternately you can leave the top off completely if you desire. 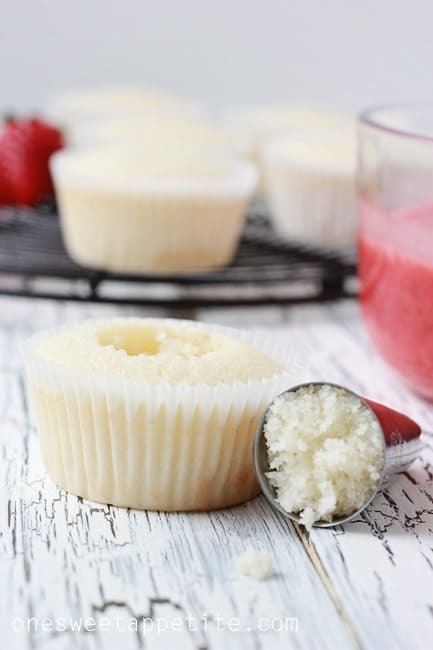 Here is the strawberry sauce I used in these cupcakes. Hope you enjoy! should the cupcake be completely cooled when making the hole, or is it easier right out of the oven? It’s easier if the cupcake is cooled. I will add that into the post. Looks easy will try. My I have your strawberry sauce receipe? Hello, I’m in need of answers before I have to bake Halloween cupcakes! 1- When filling a cupcake with a more liquified type filling, is it best to not use a super moist cupcake recipe? 2- If I make my cupcakes, fill them & frost them the night before, will they still be good by the next day? I’m wanting to make chocolate cupcakes with a strawberry filling, but the cupcakes are very moist (even after cooling). 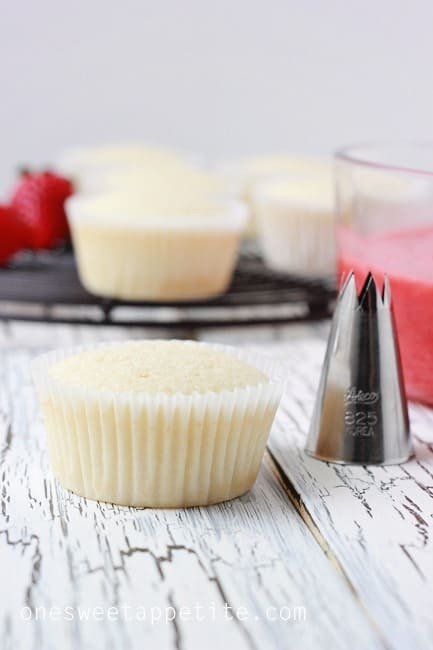 I’ve never had a problem using moist cupcakes but with runny fillings it will soak into your cake and make it a little softer. Also, you should be fine making them the night before. I use an apple corer and it works great. How smart! I will have to give that a try.